MBC Gayo Daejejun could be seen as one of those year-end music festivals that get approved by the audience and K-Pop fans. The show caught attention right from its host line-up included the K-pop beauty triplets Yoona (Girls Generation), Choi Minho (SHINee), Cha Eunwoo (ASTRO) along with the veteran entertainer Noh Hong Chul. Apart from that is the extraordinary artists line-up started from rookies to legends, there was almost every biggest star of last year. Host Cha Eunwoo suddenly found out that his senior Jimin wa sneaking a glance at the script on his hand. MBC Gayo Daejejun 2018 impressed people not just by its grand performances but also the interaction from the artists. 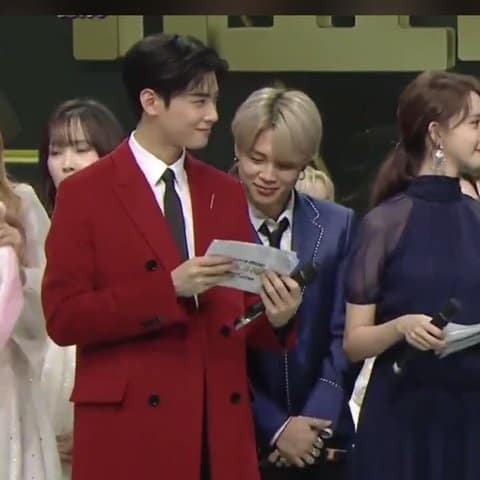 One of the most viral interaction was the moment Jimin (BTS) got caught sneaking a look at host Cha Eunwoo (ASTRO)’s MC script. 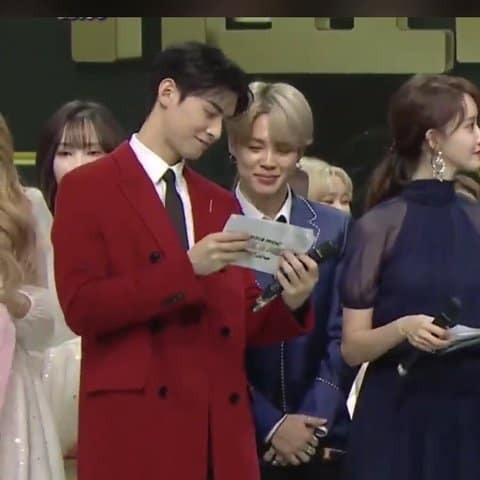 Specifically, while other artists were gathering on stage, Jimin continuously tried to sneak a peek at the script on Cha Eunwoo’s hand and he was caught by the younger idol. Seeing that Jimin was curious about the paper on his hand, the ASTRO member surprised fans by smiling and showing Jimin the whole script for him to read easily. 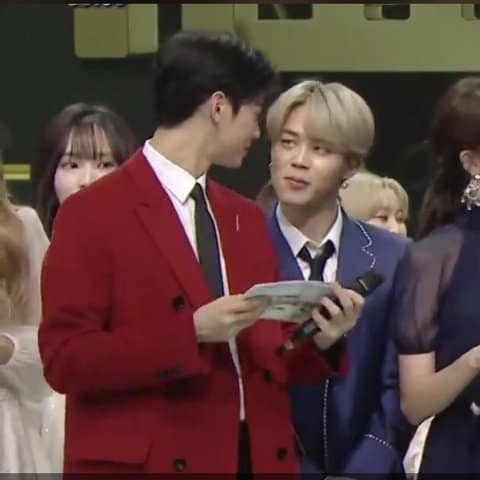 –Jimin was like: “Wow this Cha Eunwoo guy is indeed handsome. -Both of them are so cute. -Our Jimin always have a thing for handsome men. 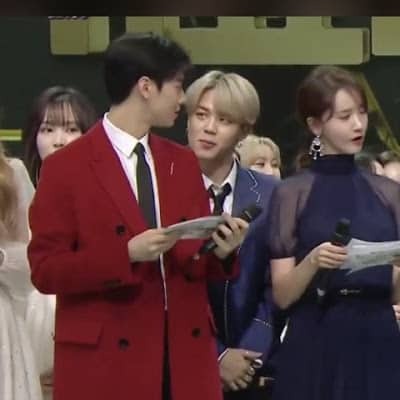 -Is it just me or Jimin always seems younger when standing next to other celebrities. He is just too cute, and Cha Eunwoo was also very sweet when he showed Jimin the script. -That’s right, our Jimin has a thing for handsome guys: Taehyun, Eunwoo, Jungkook,…But what’s worth mentioning is the handsome guys also like Jimin.